Reading and share top 21 famous quotes and sayings about Gimmicks by famous authors and people. 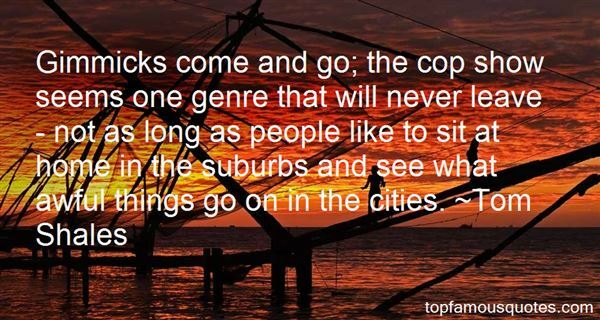 Browse top 21 famous quotes and sayings about Gimmicks by most favorite authors. 1. "People want gimmicks. They have to lose 10 pounds by 8:30 tonight." 2. "I believe in keeping running simple and, in regard to shoes, that would mean no gimmicks, unnecessary cushioning, etc." 3. "I'm not against screens, or new songs, or innovation. I just don't like the gimmicks. I want to know when worship is over that that leader's sole purpose was to glorify the Lord Jesus Christ." 4. "Clever gimmicks of mass distraction yield a cheap soulcraft of addicted and self-medicated narcissists." 5. "Design must be functional, and functionality must be translated into visual aesthetics without any reliance on gimmicks that have to be explained." 7. "Don't change a thing. That's one of the best gimmicks a band could ever come up with." 8. "When it comes to animal agriculture, there is conventional, which is really hideous, and "compassionate" or "certified humane" or whatever, which *may* be *slightly* less hideous. But it's all torture. It's all wrong. These "happy" gimmicks are just designed to make the public feel better about exploiting animals. Don't buy the propaganda of "happy" exploitation. Go vegan and promote veganism." 9. "Republicans and Democrats have used accounting gimmicks and competing government analyses to deceive the public into believing that 2 + 2 = 6. If our leaders cannot agree on the numbers, if 'facts' are fictional, how can they possibly have a substantive debate on solutions?" 10. "As your heart goes, so goes your family! If your heart isn't right, no child raising system, rules, or gimmicks will ever work. As your heart goes, so goes your parenting!" 11. "Power and profit structures're out of cahoots with current technology. Aware of new inventions, corporations put them aside, waiting for competitive reasons until they're obliged to use new gimmicks." 12. "I hate tricks. At the first sign of a trick or gimmick in a piece of fiction, a cheap trick or even an elaborate trick, I tend to look for cover. Tricks are ultimately boring, and I get bored easily, which may go along with my not having much of an attention span. But extremely clever chi-chi writing, or just plain tomfoolery writing, puts me to sleep. Writers don't need tricks or gimmicks or even necessarily need to be the smartest fellows on the block. At the risk of appearing foolish, a writer sometimes needs to be able to just stand and gape at this or that thing- a sunset or an old shoe- in absolute and simple amazement." 13. "No tricks, gimmicks, special pills, special potions, special equipment. All it takes is desire and will." 14. "You've got to live right, too. It's the way you live that predisposes you to avoid the traps and see the right facts. You want to know how to paint a perfect painting? It's easy. Make yourself perfect and then just paint naturally. That's the way all the experts do it. 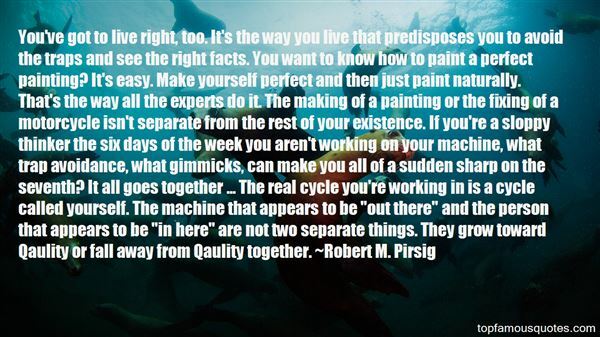 The making of a painting or the fixing of a motorcycle isn't separate from the rest of your existence. If you're a sloppy thinker the six days of the week you aren't working on your machine, what trap avoidance, what gimmicks, can make you all of a sudden sharp on the seventh? It all goes together ... The real cycle you're working in is a cycle called yourself. The machine that appears to be "out there" and the person that appears to be "in here" are not two separate things. They grow toward Qaulity or fall away from Qaulity together." 15. "I love visual gags and gimmicks; I love them." 16. "The only trouble is that in the spiritual life there are no tricks and no shortcuts. 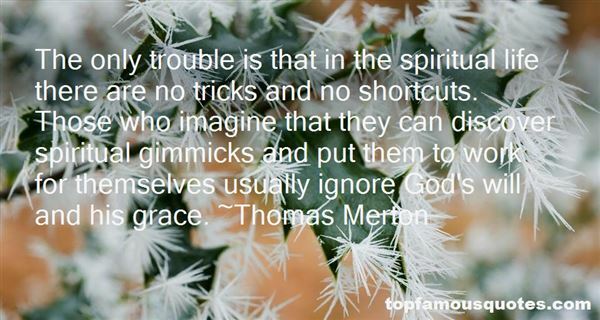 Those who imagine that they can discover spiritual gimmicks and put them to work for themselves usually ignore God's will and his grace." 17. "I just happen to comprehend the low standards of the majority of the music-buying public, and I don't care how condescending that sounds, it's true. They always go for the shiny gimmicks. Always." 18. "Every season we try to do something new. And not for gimmicks. We feel the show has to evolve and keep changing." 19. "Gimmicks come and go; the cop show seems one genre that will never leave - not as long as people like to sit at home in the suburbs and see what awful things go on in the cities." 20. "I want to show my range before I fall into any typecasting. I've turned down a lot of things trying to wait. But at the end of my career, whether that be tomorrow or 40 years from now, I would like to look back and be able to say, 'Ah, I never fell into any gimmicks.'" 21. "It is fear that makes you believe that you are living and that you will be dead.What we do not want is the fear to come to an end. That is why we have invented all these new minds, new sciences,new talks, therapies, choiceless awareness and various other gimmicks." Will you… I mean, do you want to get married?" Tove asked. "To me? ""I, um…" I didn't know what to say. "If you don't want to, nothing has to change between us," Tove said hurriedly. "I asked because it sounds like a good idea to me. ""Yeah," I said, and I didn't know what I would say until it was coming out of mouth. "I mean, yes. I do. I will. I would… I'll marry you.""Yeah?" Tove smiled hopefully, and I nodded."Yes." I swallowed hard and tried to smile back."Good." He exhaled and looked back down the hall. "This is good, right? ""Yeah, I think so," I said, and I did mean that. "Yeah," he nodded. "I sorta feel like throwing up now, though."